resources. This not only focus on tuna but the many species that are affected in the harvest of tuna resources. At the outset let us be reminded why we are here. We are here because we all agreed to collaboratively work towards a common goal. The common goal in ensuring that through consensus, we would agree to measures that will ensure the sustainable use of migratory tuna stocks and other species within the Western and Central Pacific Ocean. 1. Madam Chair, first we would like to highlight the issue of “Observers.” During WCPFC 13 in Denarau (Fiji), the intense discussion surrounding observer safety proved how important the issue of observers is to most if not all Commission members. While there are still ongoing discussions on the implementation component of the Observer CMM, Fiji would like to remind members, non-members and participants on the important role observer’s play. Observers form the basis of science. Science that allows us as Managers and Stewards to better understand the status of resources before agreeing to appropriate measures. Additionally, for many countries in the Pacific, a majority of workforce within Fisheries are made up of Observers. These are just two of the many reasons why we, Small Island Developing States (SIDS) are so passionate, and sometimes are filled with emotions when discussing observer issues. 2. Madam Chair, secondly the issue of “disproportionate burden” for Small Island Developing States is something that needs to be addressed. This however, cannot be addressed in isolation. It is important that members first understand how disproportionate burden affects each distinctive country. Different levels of development, diverse economic, social and political situations all play a role. Only by understanding this, will we be able to agree on measures through consensus. more accountable in the processes therein by ensuring that those who are certified are in full compliance with the conditions of their certificate. Madam Chair, since Fiji’s long line fishery is currently in assessment for a replacement certificate to include albacore and yellowfin tuna within our EEZ and adjacent high seas, I am pleased to confirm today that my Ministry will move a notch higher to work more collaboratively with our private sector in order for them to continue benefiting from such certification. At the same time, Fiji will be working with other Commissioners of this Commission to ensure the successful implementation of the Harvest Strategy Work Plan that was adopted in Denarau (Fiji) last year and the measures to be adopted thereafter, since the conditions of the new certificate are based on this. 4. Last but not the least, in past Commission meetings there has always been a lingering issue on the need to “control efforts in the high seas.” Frankly speaking, this has not been successfully addressed. We do not need to dwell too much on this since it is well known that the continuous failure of members to adopt relevant measures on sustainable harvesting of key tuna species due to the decision making process of the Commission. Such inaction of the Commission is negatively contributing to over-capacity in the high seas resulting in low catches in zone. We do not want to see this to continue as our Fishery may all collapse under the pressure that is being forcefully exerted upon us by the Distant Water Fishing Nations. In conclusion, Madam Chair, these are just some of the many issues and agenda items that Fiji will be engaging in during the course of this meeting. 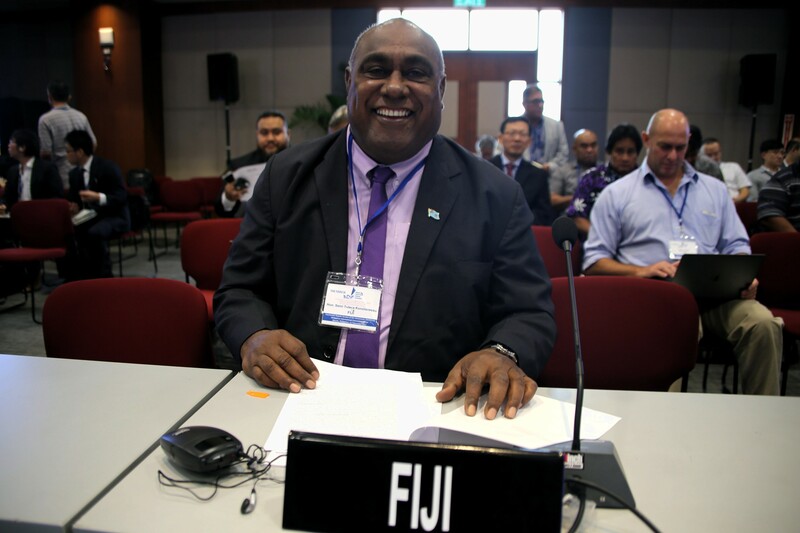 Madam Chair, Fiji supports your leadership, and we believe that at the end of WCPFC 14 the results and outcomes would show prove of what can be achieved through collaboration and consensus.